What is your favorite type of Tyhrranoid? My favorite is the ultra-mech Tyhrranoid because I can use the refractor to reflect their laser attacks back to them! so much for clean underwear! ultra-mechs, definitely! They are soooo much fun to destroy with lasers! The refractor was my favorite gadget in that game because I could use it to kill enemies! It was really funny to watch the ultra-mechs get destroyed by their own lasers! Hoisted by their own petard! It’s kind of weird that you only see the two-eyed tyhrranoids on planet veldin. I wonder why? It takes Japan 200 planes to kill under 2,000 americans in 2 hours; it takes America one plane to decimate almost half of japan and kill over 100,000 Japanese in 9 seconds. Talk about pwnage. what is the "Elite Tyhrranoid"? And that is the lot! my favourate in those One Eyed ones! I edited my list of Tyhrranoids to include the saucer and the Momma Tyhrranoid. I don't really know what an elite Tyhrranoid is, so I removed it from my list. I know, in the Insomniac Museum, they said there were 2 types of enemies that were cut because it was too much effort to make an enemy that only ever appeared in one level, but they did that for the 2 eyed 'noids, so why couldn't they have featured those other 2 enemy types? Actually, the two eyed 'noids were the ones controlling the saucers and the ultra-mechs, so they actually do appear in almost every level, It's just that after Veldin, they operate the machinery and don't appear on foot. three eyed are not exactly the strongest around and not the smaertest either. Spose it is there ability to use heavy weaponray and fire it in the genral direction of its target! Four eyed are the strongest and they have epic laser guns. And can fly! the award for best tyhranoid goes to… Two eyed. 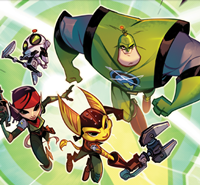 Because without them the army is as useful as Qwark with no muscle! I like a challenge so, ROBOT FOUR EYED! 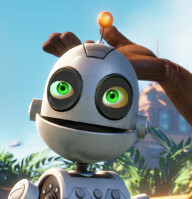 Qwark? He dosen't need weapons when he has his special move! It's called the " Flying Qwark Punch! " Haha, my favorite is the four eyed, because hes just super badass! As for the Elite Thyrranoid, maybe Ratchetgamer thought the Elite Thyrranoid is the Five eyed one on the far left of the artwork in which you can see most of the tyhrranoids. listen to ma music! I Promise you won't regret it. Is it weird to advertise here? Eh whatever. Oh, what's this? Might it be.. Yes! It is a link to my LittleBigPlanet profile, how convenient! It would be a shame if you wouldn't take advantage of this unique chance and check some of my stuff out! I like the 4-eyed green ones, because they reminded me of the bikers from Joba andthe other planet in GC with the laser guns. I like hockey, video games, cats, and books. That makes me a boss right?